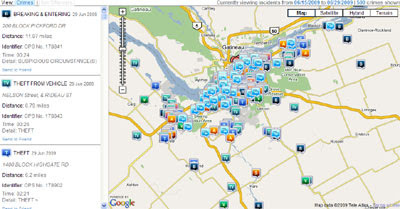 US crime mapping website CrimeReports.com had added two Canadian cities to its coverage. The site now has Google Maps showing crimes in Brandon, MB and Ottawa, ON. This article can also be useful – Quebec, Canada, Free Printable Map in Adobe Illustrator and PDF. Level 12 (5000 meter scale) map, G-VIEW, fully editable, in in vector format. SpotCrime also allows you to search for crime by date and location. By adding the crime id’s of individual crimes to SpotCrime’s url (with comma separation) you can also create your own map featuring only the crimes you have selected.